Before: 3 Unit bridge with chipped porcelain molar (supporting metal showing on molar tooth), poor enamel color match to patient's natural teeth, and poor fit around the patient's gumline. 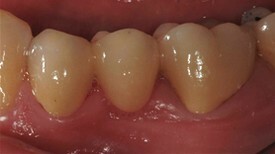 After: Replaced Bridge with an All Porcelain Bridge. 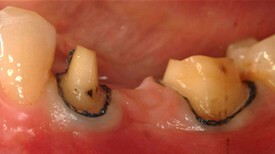 The new bridge now also matches the patient's natural tooth color and was designed to properly fit around the gumline. 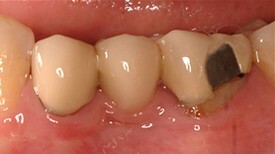 Proper fit aids in decreasing decay and the ease of the patient's ability to clean around a bridge. Dr. Guerrero and staff are very professional and personable. They made me feel comfortable the minute I walked in the door. It is a very clean and hygienic office. I highly recommend Everbright. Dr G. Is a great dentist. She does a good job of looking after your needs. The whole office is always friendly and happy to see you. Kind caring and very welcoming staff! Dr. Guerrero was so easy to talk to. Taking her time explaining my tooth issues and making me feel very comfortable. The whole team at Everbright is friendly, caring and competent. Actually didn't even mind replacing 2 very old fillings--no pain whatsoever, and a perfect bite outcome. I highly recommend this practice. Time for my annual checkup. Again, I can not say enough about the excellent service Dr. Guerrero and her staff provide. I am extremely pleased with the services I received from Dr. Guerrero and her staff. They are very professional, efficient, courteous and friendly. I would highly recommend this Dental Office to anyone interested in their services, including my family and friends. Great experience. Dr. Guerrero and her team were super friendly and thoroughly explained everything to me throughout the entire visit. I highly recommend them to anyone that lives in Santa Clarita looking for a family dentist. Dr. Guerrero has been our dentist for the past 3 years. She is very competent and does timely treatments preventing major dental costs. She also provides great recommendations on how to take proper care. Front-office people are great and always advice upon treatment costs in advance with no surprises. I have never felt pressured at this facility. I highly recommend Everbright Dental! Dr. Guerrero and her staff are so caring and friendly. Miriam, the dental hygienist, is so gentle and I really appreciate that. Dr. Guerrero is so kind and friendly but very thorough and knowledgable. I am so thankful that I found this wonderful dentist. Dr. Guerrero and her staff are the best. They make sure that you are comfortable during any procedure. It has been many years since I had a dentist I wanted to recommend but I have Dr. Guerrero now and she is really good. You won't be disappointed if you choose her as your dentist.